plan B is delighted to be part of the exciting new Youth Arts Hub for the Highlands. The Highland Youth Arts Hub is one of nine hubs being set up across the country as part of the National Youth Arts Strategy, Time to Shine. In the Highlands, 12 youth and arts organisations are working in partnership to develop this exciting new initiative. The partners are: Aros / Skye Dance, Eden Court, Fèisean nan Gàidheal, Fèis Rois, Highland Council, Highland Print Studio, High Life Highland, Moniack Mhòr, plan B, Room 13, University of the Highlands & Islands and Youth Highland. As the Hub develops, we look forward to engaging many more partners throughout the Highlands. The Highland Youth Arts Hub aims to increase access to youth arts activities across the region and across a range of art forms including dance, digital art, drama, film, literature, music and visual art. We will be working together to offer more cross art form activities and to address issues like accessibility and participation. The Hub will nurture and celebrate ambition, enthusiasm and talent in young people by improving the regional infrastructure and developing a new youth arts strategy for the area called Highland’s Time to Shine. Young people will be central to the development of the Hub. They will steer the direction of the work and make key decisions as the project will be led by a new Highland Youth Arts Forum. The Hub is currently planning creative projects that will kick off in January 2015 whilst a new Creative Careers weekend and Annual Youth Arts Festival are in the pipeline for later next year – stay tuned and keep an ear out for what’s going on in your area! Keep up to date with the National Time to Shine programme by following @TTSYoutharts on Twitter. If you would like more information on the Hub please contact Stacey, the Highland Youth Arts Hub Project Manager. If you are interested in becoming involved with the Hub or any of its projects, or would simply like to express a want and/or need for creative provision in your area, please contact Stacey. If, however, you’d feel more comfortable speaking with one of the Youth Arts Forum representatives please contact Katie. Shuffle Rewind (#6) too place on Saturday 5 December, 7.30pm at The Shed. Shuffle Rewind was an eclectic and 'alternative' Christmas night out! Curated and performed entirely by incredibly talented and professional young people there was dance, film, music, theatre, visual art and much much more. Shuffle Rewind (#4) took place on Saturday 28 March. It was curated by young people (Aine Beattie, Nada Tolliday, Caitlin Dolan, Alia McGeoch and Josie Tolliday) and took place at plan B's unique base in Evanton, The Shed. * Music by Jake Cameron, Almost Folk, Grace Stuart-Skinner, as well as Alia McGeoch and Aine Beattie. Further Shuffle info can be found here. Are you aged 12 – 25 with an exciting creative project idea? The Highland Youth Arts Hub could contribute up to £500 for a project idea put forward by an individual, and up to £1,000 for a project idea put forward by a group of two or more people. For more info download the info doc here. How can I apply? 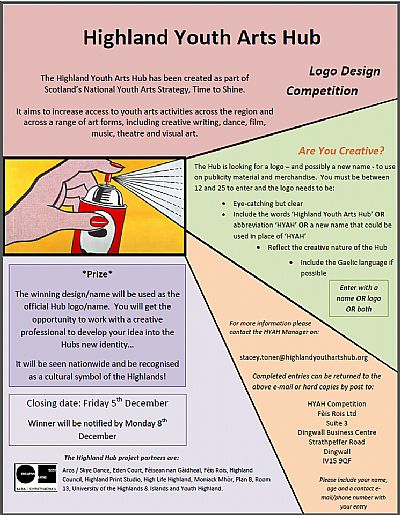 Contact Stacey.toner@highlandyouthartshub.org, Highland Youth Arts Hub Manager, for full details of this opportunity and a copy of the application form. The Hub is looking for a logo – and possibly a new name - to use on publicity material and merchandise. You must be between 12 and 25 to enter and the closing date is: Friday 5th December. More info on the flyer below!